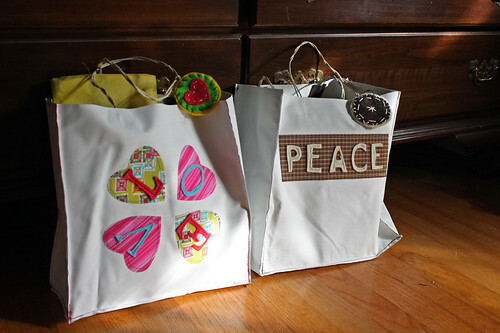 Do you remember these super cute bags Dana made for the SYTYC competition? 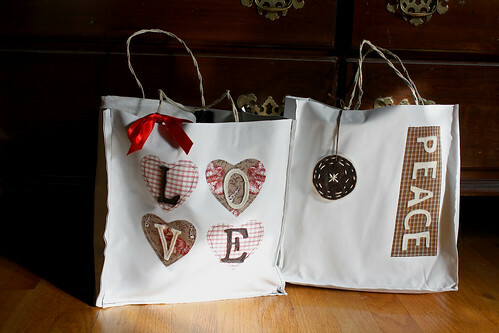 I thought they were so cute that I made some gift bags like them. Instead of doing all the plastic bag fusing, I used black out material (for going behind curtains) that I had on hand. I’ll admit, I was lazy and didn’t have that many plastic bags on hand either. I had bought the material for only $3 a yard during a super sale at JoAnn’s and had a huge roll of it that I wasn’t using. It is very easy to sew and it doesn’t fray at all. I chose to focus on three words to go on them: Peace, Joy, Love. I chose these because I feel they have a lot to do with Christmas. The fabric I used was all fat quarters from JoAnn’s. I love those because then when my daughter is ancy I can just grab some and go. No waiting in line to get some fabric cut. I used felt for the letters. I was in a hurry to finish, so I used hemp/twine string for the handles. I wrapped two pieces together, glued them on two places on the inside front (and then another 2 on the back). Then I glued on a piece of felt to cover up the glue and string ends. I added some pom poms and felt embroidered ornament things I made to handles. beautiful, great use of that blackout fabric! Wow! I love these! What cute bags! 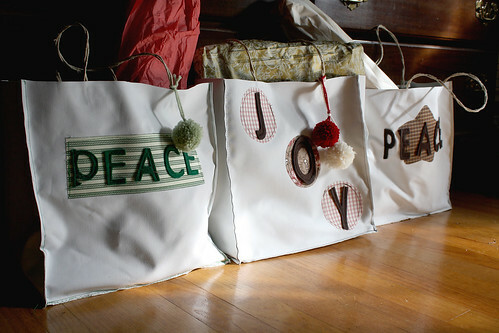 Those bags are like an added present in addition to the gift inside. those are so stinkin’ cute — you have the most creative ideas!! i recited that Bible passage when i was five at a Christmas church service 🙂 it warms my heart. These look great and I think the fabric would be more durable than fused plastic and could be used over and over again. what a fantastic idea. Will definately be making some of these. Merry Christmas. I found the plastic fusing difficult anyway! These are so cute! 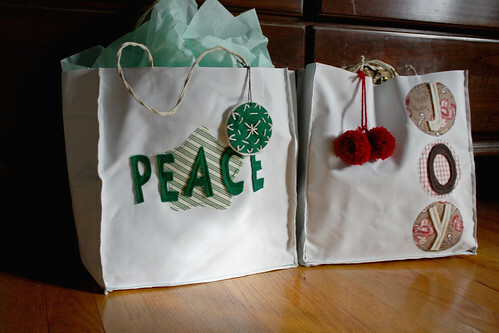 I especially love the green “peace” one in the first picture with the green pom pom! they are very beatiful. 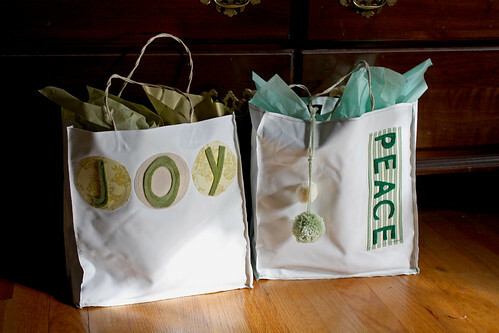 thanks for sharing..
Love the bags…super cute idea….Enjoying your blog, I added it to my side bar so I can visit often. Jessica, your bags turned out great! 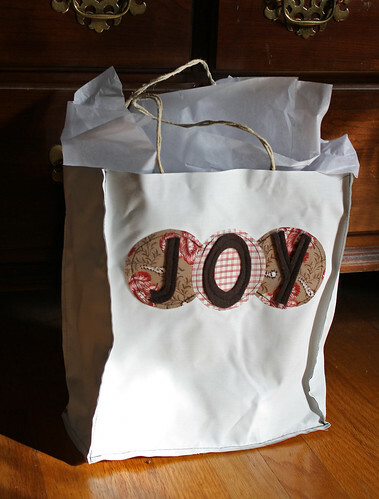 what a fun idea to make them into gift bags. Love it.